I've been feeling a little more energetic over the last few days and I've decided to so some beauty swatches. I've had these eyeliners for months but have only just got around to swatching them, and I'm so happy I did, because I love them. 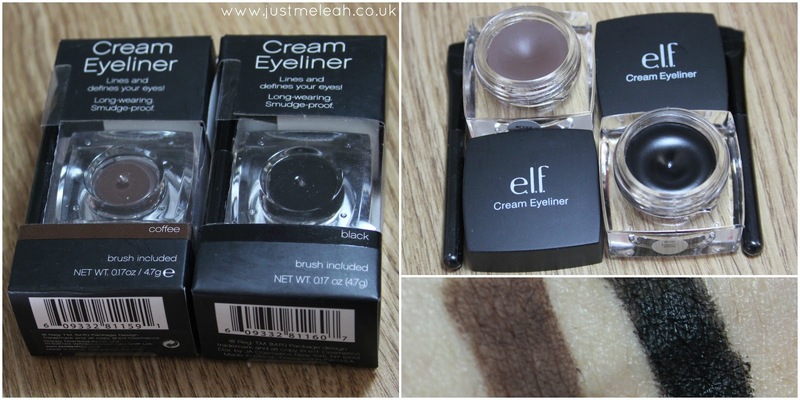 Each eyeliner is 4.7g in a glass pot with a plastic lid and comes with a tiny brush which is actually great to apply the eyeliner with. I have eyeliner brushes but I find it really easy to use the brush it comes with, even though it's only about 2 inches long. 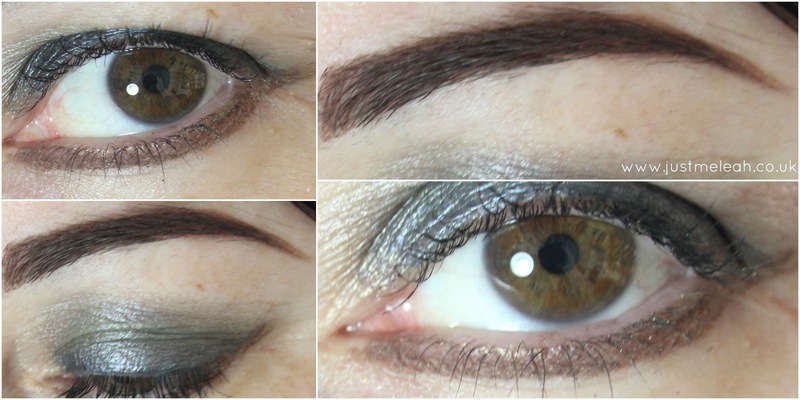 As you can see from the swatches above, the brown is very matte and the black is more glossy. It's £3.95. The shade Coffee is actually a great match for my eyebrows, and because it dries solid after about 15 seconds, it's fantastic at defining my brows and keeping them in place too. I've been using eyebrow powder for the last 4-5 years, and it always makes my brows look a bit muddy and indistinct, whereas the eyeliner gives a really crisp line. This is my new brow product of choice. In the swatches of eyeliner (in both colours) on my lower lash line you can see a golden tinge, and that's left over from the gold eyeliner I had on previously in the day. I couldn't see the gold with the naked eye, but the camera has picked it up. 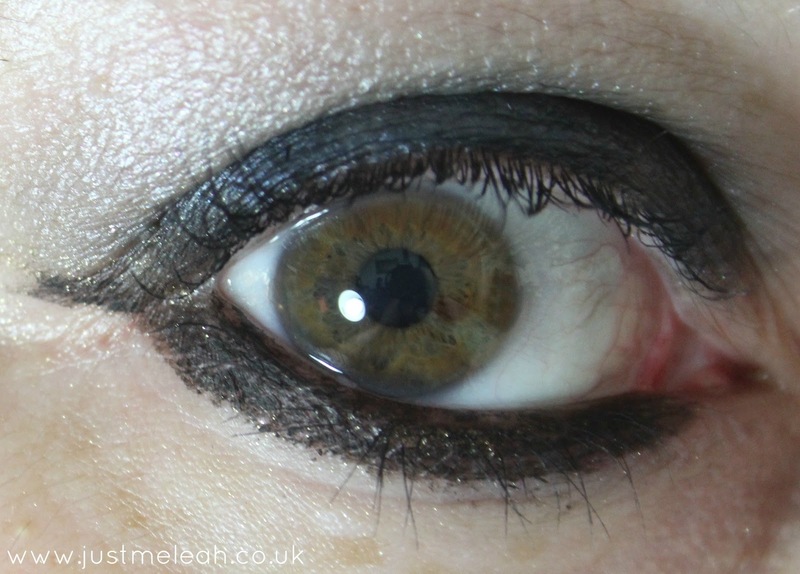 Here's the black, again with a few specks of gold hanging on from the previous eyeliner. I tried the black on my waterline to test how it lasts on my very watery, sensitive eyes and a few hours later it was mostly all there. I removed the remaining eyeliner at about 2 am when I went to bed (I had black on one eye and brown on the other) and despite having a good cry earlier in the evening the black was mostly still in place. The brown hadn't fared quite so well on my eye, but was pristine on my eyebrow. I'm not sure if I rubbed the eye with the brown more or if the black lasts longer. Both colours did dry and flake a little after a few hours which needed clean up with a wet cotton bud, but that happens no matter what eyeliner I wear. If you try to wipe the flakes away dry you'll get streaks of it on your face if you're not careful. I always carry cotton buds in my makeup bag in my handbag for such things. Even expensive eyeliners like Urban Decay give me slight panda eyes after a few hours, so it's no deal-breaker for me. Have you tried these eyeliners? If so, how did you find them? P.S. There will be more regular beauty posts for the time being (as long as I have the energy to swatch, because beauty swatches can be a time-consuming ball ache.) I'm kind of more into makeup than clothes at the moment - having sworn off both Simply Be and New Look Inspire has me running short of options - so I'm buying makeup more often than clothes.